EUGENE, Ore.—In 2014, Ninkasi Brewing Company, an independent craft brewery based in Eugene, Oregon, embarked on a journey that took its beer to new heights—77.3 miles above Earth to be exact. The Ninkasi Space Program (NSP), was an initiative with one goal in mind: send brewer’s yeast to space, return it to Earth to brew delicious beer. In October 2014, Ninkasi sent six vials of brewer’s yeast to space aboard a rocket launched from Spaceport America and later, released its first “space beer” in 2015, Ground Control. This year, the beer returns with its sequel—Bourbon Barrel-Aged Ground Control. Brewed with Oregon hazelnuts, star anise and cocoa nibs, this Imperial Stout is fermented with an Ale yeast that survived a trip to space, barrel-aged for four months and blended. 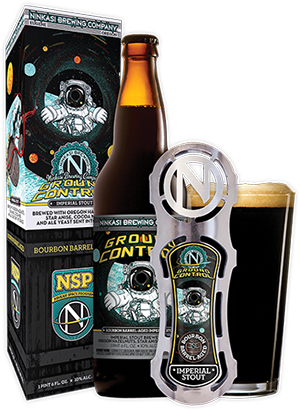 Bourbon Barrel-Aged Ground Control can be found in limited-edition 22-ounce bottles starting April 12, 2016 throughout Ninkasi’s distribution territory.